This page shows the latest Therakos news and features for those working in and with pharma, biotech and healthcare. bought Cadence Pharma for $1.3bn, Questcor for $6.5bn, immunotherapy outfit Therakos for $1.3bn and nuclear imaging specialist IBA Molecular for £690m in the last three years. 30600. Therakos. 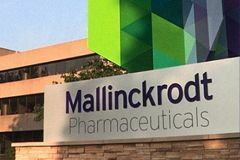 Mallinckrodt. Approved cell therapy platform for the palliative treatment of cutaneous T‐cell lymphoma [CTCL].